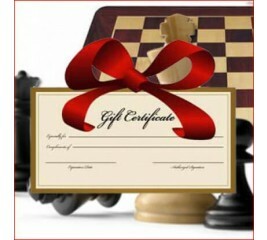 Gift Cards ensure that your special chess player in your life always gets the perfect chess gift. You get to specify the value of the gift card, from 1.00 to 500 US Dollars, and we'll automatically email the gift card when the order is completed. Gift Cards ensure that your special chess player in your life always gets the perfect chess gift. You get to specify the value of the gift card, from $1.00 to $500 US Dollars, and then print out the Gift Card to present it to the lucky recipient.